ILI 2009 | "Self-plagiarism is style"
I’m still in two minds about whether or not the word “exploit” has too many negative connotations, but what the heck! 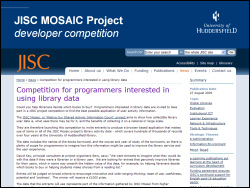 As part of the development of the UK version of Horizon back in the early 1990s, libraries requested that the company (Dynix) add code to log all circulation transactions. 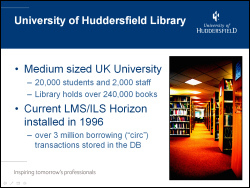 Horizon was installed at Huddersfield in 1996 and has been logging circulation data since then. At the time of writing this blog post, we’ve got data for 3,157,111 transactions. 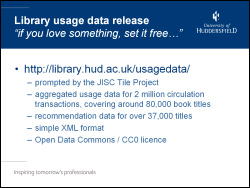 With that volume of historical data, it seemed sensible to try and create some useful services for our students. 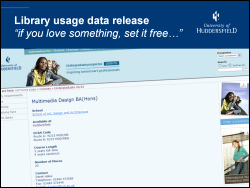 In November 2005, we started dabbling with an Amazon-style “people who borrowed this” service on our OPAC. After some initial testing and tweaking, the service went fully live in January 2006. The following month, we added a web service API (named “pewbot”). To date, we’ve had over 90,000 clicks on the “people who borrowed this, also borrowed…” suggestions, with a peak of 5,229 clicks in a single month (~175 clicks per day). 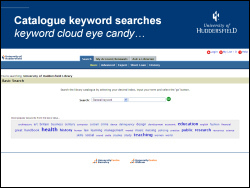 Apart from the “Did you mean?” spelling suggestions, this has been the most popular tweak we’ve made to our OPAC. 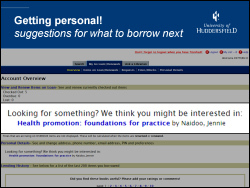 Because we’re an academic library, we get peaks and troughs of borrowing throughout the academic year. The busiest times are the start of the new academic year in October and Easter. 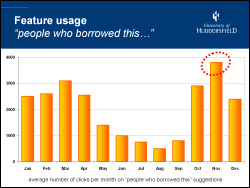 If you compare the number of clicks on the “people who borrowed this, also borrowed..” suggestions, you can see that it’s broadly similar to the borrowing graph, except for the peak usage. Due to the borrowing peak in October, in November a significant portion of our book stock will be on loan. When our students find that they books they want aren’t available, they seem to find the suggestions useful. I’m hoping to do some analysis to see if there’s a stronger correlation between the suggested books that are clicked on and then borrowed on the same day during November than during the other months. 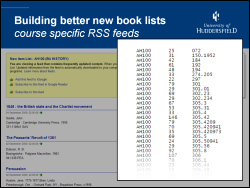 Once a user logs into the OPAC, we can provide a personal suggestion by generating the suggestions for the books they’ve borrowed recently and then picking one of the titles that comes out near the top. I was originally asked to come up with some code to generate new book lists for each of our seven academic schools. It turned out to be extremely hard to figure out which school a book might have been purchased for, so I turned to the historical book circulation data to come up with a better method. Rather than having a new book list per school, we’re now offering new book lists per course of study. 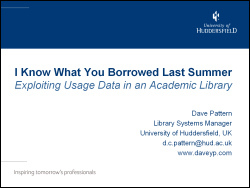 The way it’s done is really simple — for each course, we analyse all of the books borrowed by students on that course and then automatically build up a Dewey lending profile. Whenever a new book is added to our catalogue, we check to see which courses have previously borrowed heavily from that Dewey class and then add the book details to their feeds. The feeds are picked up by the University Portal, so students should see the new book list for their course and (touch wood!) the titles will be highly relevant to their studies. 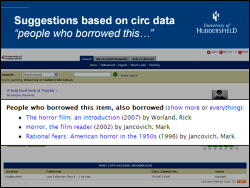 One of the comments I frequently hear is that book recommendation services might create a “vicious circle” of borrowing, with only the most popular books being recommended. At Huddersfield, we’ve seen the opposite — since adding recommendations and suggestions, the range of stock being borrowed has started to widen. 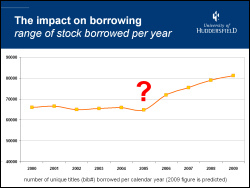 From 2000 to 2005, the range of titles being borrowed per year was around 65,000 (which is approximately 25% of the titles held by the library). 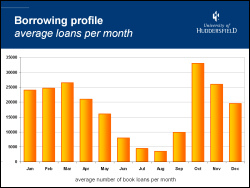 Since adding the features in early 2006, we’ve seen a year-on-year increase in the range of titles being borrowed. 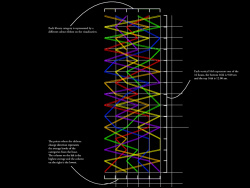 In 2009, we expect to see over 80,000 titles in circulation, which is close to 33% of the titles held by the library. I strongly believe that by adding serendipity to our catalogue, we’re seeing a very positive trend in borrowing by our students. Not only are students borrowing more widely than before, they’re also borrowing more books than before. From 2000 to 2005, students would borrow an average of 14 books per year. In 2009, we’re expecting to see borrowing increase to nearly 16 books per year. We’re also seeing a year-on-year decrease in renewals — rather than keeping hold of a book and renewing it, students seem to be returning items sooner and borrowing more than ever before. We’re also logging keyword searches on the catalogue — since 2006, we’ve logged over 5 million keyword searches and it’s fun looking at some of the trends. As we had a bit of dead space on the OPAC front page, we decided to add some “eye candy” — in this case, it’s a keyword cloud of the most popular search terms from the last 48 hours. Looking at the usage statistics, we’re seeing that new students find the cloud a useful way of starting their very first search of the catalogue, with the usage in October nearly twice that of the next highest month. A much more useful service that we’ve built from the keywords is one that suggests good keywords to combine with your current search terms. In the above example, we start with a general search for “law” which brings back an unmanageable 7000+ results. In the background, the code quickly searches through all of the previous keyword searches that contained law and pulls together the other keywords that are most commonly used in multi-keyword searches that included “law”. 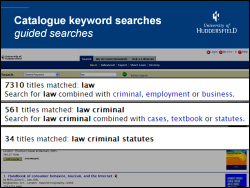 With a couple of mouse clicks, the user can quickly narrow the search down to a manageable 34 results for “criminal law statutes“. 2) The service acts as a feedback loop — the more searches that are carried out, the better the suggestions become. I forget exactly how this came about (but I suspect a conversation with Ken Chad sowed the initial seed), but we decided to release our circulation and recommendation data into “the wild” in December 2008 — see here for the blog post and here for the data. The data was for every item that has an ISBN in the bibliographic record, as we felt than the ISBN would be the most useful match point for mashing the data up with other web services (e.g. Amazon). 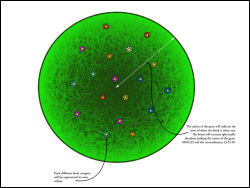 We realised that we’d need to use a licence for the data release and, after a brief discussion with Ken Chad, it became increasingly obvious that a Public Domain licence was the most appropriate. 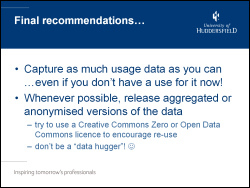 Accordingly, the data was released under a joint Open Data Commons and (partly because we couldn’t decide which licence was the best one!). In other words, we wanted it to be really clear that there were “no strings” attached to how the data could be used. Within a couple of days of releasing the data, Patrick Murray-John at the University of Mary Washington had taken it and “semantified” the data. A few weeks later, I had the privilege of chatting to Patrick and Richard Wallis when we took part in a Talis Podcast about the data release. My great friend Iman Moradi (formerly a lecturer at Huddersfield and now the Creative Director of Running in the Halls) used some of the library data as part of the Multimedia Design course. 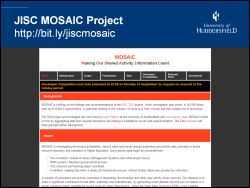 The JISC funded MOSAIC Project (Making Our Shared Activity Information Count), which followed on from the completed TILE Project, is exploring the benefits that can be derived from library usage and attention data. The prototype search engine is of particular interest, as it uses the pooled usage/attention data to rank results so that the ones which are more relevant to the student (based on their course) are boosted. For example, if a law student did a search for “ethics”, books on legal ethics would be ranked higher than those relating to nursing ethics, ethics in journalism, etc. This is achieved by deep analysis of the behaviour of other law students at a variety of universities. 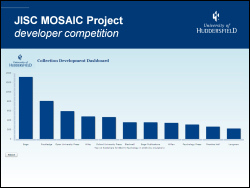 The MOSAIC Project is also encouraging the developer community to engage with the usage data, and this included sponsorship of a developer competition. 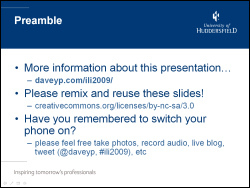 It was hard to pick which competition entries to include in the presentation, so I just picked a couple of them at random. 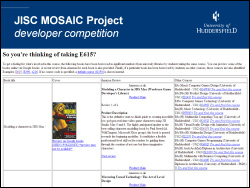 The winning entry, and the two runners up, should be announced shortly — keep an eye on the project web site! 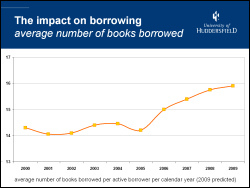 The library usage graphs on slides 9 and 10 clearly show that borrower behaviour has changed since the start of 2006. Given that this change coincided with the introduction of suggestions, recommendations and serendipity in the library catalogue, I believe that there’s a compelling argument that they have played a role in initiating that change. With the continuing push for Open Data (e.g. see the recent TED talk by Tim-Berner’s Lee), I believe libraries should be seriously considering releasing their usage and attention data. Most usage based services require some initial data to work with. So, given that disk storage space is so cheap, it makes sense to capture as much usage/attention data as possible in advance, even if you have no immediate thoughts about how to utilise it.